The Automotive Interior Specialist who believes in stringent norms for quality and styling that delivers a great experience of style and comfort. The Materials used by us are of thickness (0.9mm to 1.2mm) with printed grain structure made on imported sophisticated machines. 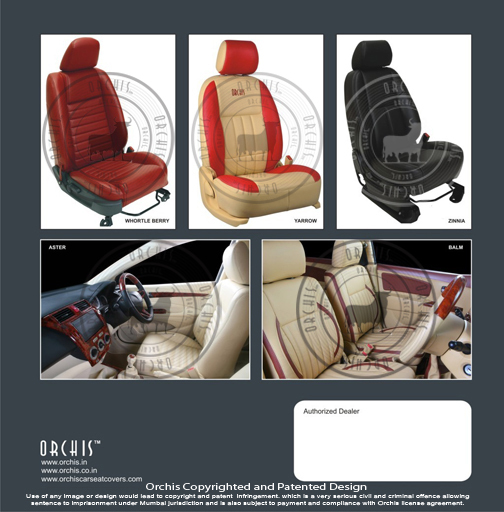 1) Musk-(0.9mm thickness) Orchis seat covers for cars are sold in a large variety of styels & colors, each car seat covers is made with unique wear upholstery grade & laminated material. 2) Lily-(0.9-1.1mm thickness) Composite leather that provides a higher resistance to regular wear besides being tough, durable and hard-wearing. 3) Tulip-(0.9-1.0mm thickness) Composite leather that has a higher resistance to regular wear and an ideal choice while providing an experience of comfort. 4) Lotus-(0.9-1.1mm thickness) This range of composite leather covers is a vibrant collection with shades and colors that reflect the contemporary fashion trends, providing optimum comfort. The tough and durable look is soft and supple to the feel. 5) Marigold-(1.1-1.2mm thickness) Composite leather backed with rich cotton felt coating that regulates the temperature while styling and luxury is the center of comfort. Besides being hard-wearing tough and durable, it is soft and supple. 6) Poppynapa-(1.1-1.2mm thickness) Composite leather designed with an advanced serene finish technology. 7) Acacia-(1.1.-1.2mm thickness) Composite leather backed with cotton felt that regulates the temperature while styling and luxury is the centre of comfort. The leather from Europe, South America and New Zealand are handpicked and processed using sophisticated Italian tanning technology to produce a vibrant range of textures and colors, presenting an exclusive array of choice for the customers. This luxurious soft leather goes through multiple processes in order to gain optimum softness and sufficient tear resistance. We offer exclusive wooden dash kits that are available in wide variety of designs and colors. Our products are made of walnut, ebony, pine and other wood colors. These can also be made available in different stains, from rosy red to natural blond. We offer wood finish steering wheel that makes it look elegant and enhances the comfort level of the wheel while driving. The entire range is available in different colors and designs and we also offer tailor-made products as per client specifications. The door trims that we manufacture are available with customization of the same tone or color to seats and dash boards. The most prominent acrylic glue in spine of moulding is just press on desired surface for a long lasting bond. We manufacture various types of car interiors that help in upgrading the ambience and enhance the comfort level of the car. The combination of craftsmanship, high technology guarantee, high elasticity, distinctive production line and cost efficiency are some of the qualities delivered by Orchis. Note: Beware Of Fakes & Imitations. Always Look For The “Orchis” Badge & Warranty Card. Near Pawai Hirandani hospital, Vikhroli (West).